Landmarks of any city can look entirely different when the sun sets and the neon lights of nightlife pierce through the darkness. 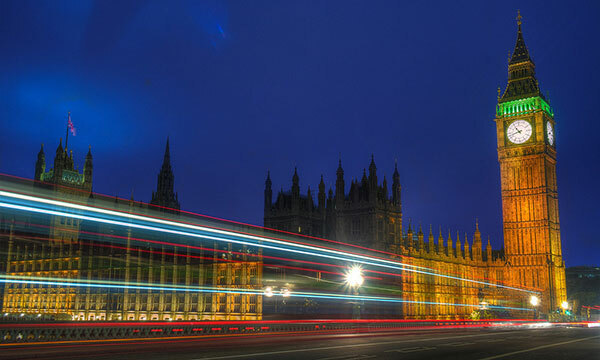 Today, Gadling Flickr Pool member Joe Newman showcases London’s Big Ben at night, as traffic streams past. London may be known for its rainy climate but one hotel in the British capital has decided loaning out umbrellas just wasn’t cool enough for its elite clientele — not when you could loan out Burberry trench coats instead. The Maybourne Hotel Group — which runs a number of high-end hotels in London — is placing the designer raincoats in suites so that guests can ward off the weather. Visitors can use the Burberry coats for free during their stay, but will have to cough up around $1,500 if they want to take them home. Trench coats are just one of many luxurious perks hotels are offering to woo guests. Over the years, we’ve seen all sorts of cool and surprising things on loan to travelers.If you’re staying at the Four Seasons in Beverly Hills, there’s no need to worry about picking up a cramped rental car. The hotel will set guests up with a nice set of free wheels — all you have to do is decide if you want to hit the road in a Porsche, Lamborghini, Rolls Royce, Ferrari, Cadillac, Mercedes or Bentley. Earlier this year, the Burj Al Arab in Dubai announced it was letting guests play with an iPad during their stay. Of course, being Dubai, they’re not just handing out any old iPad — their blinged-out devices are plated in nothing less than 24-carat gold. And finally, if you’re tired of everything in your suitcase, you can put together a killer new outfit thanks to the Fred Segal lending library at the Loews Santa Monica Hotel. The program lets hotel guests borrow a range of accessories such as expensive purses, necklaces and sunglasses from the upscale clothing retailer. Have you come across any other lavish hotel perks? My wife and I had just left the Musee D’Orsay when a young woman came running up to us clutching a ring. The pretty brunette spoke in halting English, saying she saw it drop to the ground as we walked by. After a quick scan of our fingers, we told her we weren’t missing any rings, but she placed the ring in my hand and insisted we take it for friendship. Before my heart could swell with the joy of international love and brotherhood, she then asked for money for a cup of coffee. At that point, I realized it was a scam and handed her back the ring, which she no doubt tried to foist onto another hapless tourist couple. While our stay in Paris was overall a wonderful experience, criminals threatened to put a damper on our trip. Before our flight out of Charles de Gaulle Airport, we would be accosted by other scam artists several more times, and my wife was pick-pocketed on the Paris Metro. Luckily the hipster shorts I bought in a Parisian boutique were so tight, I could barely get my fingers into my pockets, let alone a common thief do the same. Unfortunately, theft and scams are all too prevalent in most major metropolitan areas. Staff members at the Louvre actually went on strike for a day earlier this year, protesting the unsafe working conditions caused by thieves and scam artists. Bob Arno, co-author of Travel Advisory: How to Avoid Thefts, Cons, and Street Crime While Traveling, estimates about 70 percent of Barcelona tourists will be approached by a street criminal; of those incidents, about 33 percent result in the loss of valuables. According to the US government, Paris, Barcelona, London, Rome, Amsterdam and Naples have the highest number of scam artists looking to take advantage of naïve or distracted tourists. Forgo purses or strapped bags in favor of body wallets or buttoned pockets. Leave fancy jewelry or expensive watches at home. Don’t flash expensive electronic equipment –- particularly iPhones, thieves love them –- around. Have the number for the local police department saved in your phone. Keep your passport and other important documents in the hotel safe, after you’ve scanned or photographed them and saved them in a file-sharing app or program like Evernote or Dropbox. Stay alert. While you might be tempted to buy that second bottle of wine after dinner, realize drunk tourists are easy targets. What are your tips for staying safe abroad?